There’s an unwritten rule in baseball — actually, there are a bazillion of them by actual count, but we’re going to talk about just one — that says rookies who start the season in June don’t make the All-Star squad. Being an all-star is a big deal and you don’t become one in two months. This is how the thinking goes, and it’s been a good bit of brainwork for the entire history of the game of baseball. But unwritten rules, like records and political promises, are made to be broken. And the time has come to break this one — depending on what happens Monday. That’s when Stephen Strasburg makes his fifth start of the season, against the Braves. If Strasburg pitches as he has in his previous four starts, he belongs on the National League All-Star team as surely as pinstripes belong on Yankee home uniforms. A lot of baseball traditionalists don’t think this is a good idea. Strasburg has been in the big leagues less than two months. By the All-Star break, he will have had just six starts. Yes, he’s been great — so far. But he’s barely been up long enough to memorize the route to the ballpark. The All-Star game is for excellence over the first half of the season, not June and part of July, the argument goes. If you give a spot to Strasburg, you will be setting a bad precedent. You will also be taking a roster spot away from some other deserving big leaguer. These are great arguments for anyone else, but not for Strasburg. The event we’re talking about is the All-Star game. Stephen Strasburg is a star. Not a little star of the sort you might find shedding a dim puddle of trembling light in Cleveland or Pittsburgh, but a great big, blazing supernova that lights up half the planet. You give the fans the players they want to see in the All-Star game. That’s why the fans vote for the starters; it’s about who they want to see. And this kid is at the top of every fan’s to-see list. Sure, maybe he’ll flame out in August, or his arm could fall off, or he could be hit by a bus, or he could decide he’d really rather go to Nepal to join a monastery and contemplate his navel. But right now, this kid is the biggest rookie star we’ve seen. He’s not just a big kid with a ton of talent that needs to be developed. He’s not a slab of marble waiting to be carved into something. He’s already the David; he’s a finished masterwork. The thought that he can and will get better is enough to make a hitter start looking for another line of work with a better chance of success, like teaching Lady Gaga how to dress nicely. You can’t find anybody who is skeptical about Strasburg’s future, and it’s not just because he throws 100 mph. It’s because he throws four pitches — two different fastballs, a knee-buckling curve and a change — and he throws them all for strikes. Control and high velocity don’t usually go together. Sandy Koufax needed six years to learn control, Randy Johnson needed forever, and Nolan Ryan never really learned it at all. This kid has 41 strikeouts — the most ever for a rookie’s first four starts — and just five walks. In his last two games, he hasn’t walked anyone. He’s given up five runs in those four starts and his ERA is 1.78. Strasburg is the player every fan wants to see, every kid wants to be, every player wants on his team. He’s young and tall and strong and down-home. He works fast, like he’s got a plane to catch, and he doesn’t waste pitches. Nobody needs to worry about him buckling under the pressure of the national spotlight, either. Every game is nationally televised, every press box packed to the gunwales, and it doesn’t seem to bother him anymore than a bad smell bothers a housefly. He’s been so good that Ozzie Guillen, whose White Sox faced him in interleague play, anointed him the best pitcher in the National League. That’s not true; Ubaldo Jimenez is better. But Ozzie did say he hadn’t seen Jimenez. In that case, Ozzie’s right. And if you’re the best, or even the second best, you belong in the All-Star Game. 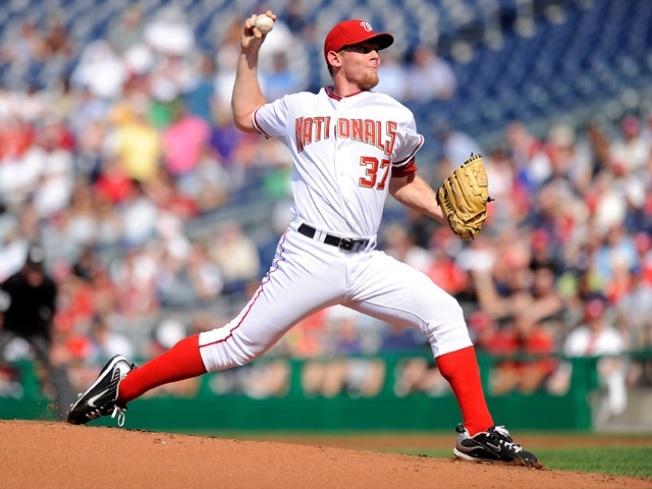 Stephen Strasburg is the game’s showcase talent and he belongs at the summer’s showcase event. It’s so simple and clear that even baseball should be able to get this one right.